WEST WINDSOR – In its ongoing efforts to prepare employees for the latest workforce challenges, Mercer County Community College’s (MCCC) Center for Continuing Studies (CCS) is placing business and technology courses at the forefront of its offerings for 2015. Career-focused business certificates and six new online offerings are among the classes making their debut. CCS certificate programs are designed to help adults quickly learn the comprehensive skills they need to achieve their career goals. Programs emphasize areas of job growth such as Cyber Security, taught by expert Daniel Minoli (author of two books on the subject), Project Management, Graphic and Web Design, and Gerontology/The Study of Aging, among many others. Programmable Logic Controllers instructor Rick Vanderbilt (left) during a recent class at MCCC’s Center for Continuing Studies. Individuals interested in the course can e-mail langanr@mccc.edu. This year, CCS is partnering with the Society for Human Resource Management (SHRM) to offer the newly-updated Body of Competency and Knowledge (SHRM BoCK) Certification Prep course. 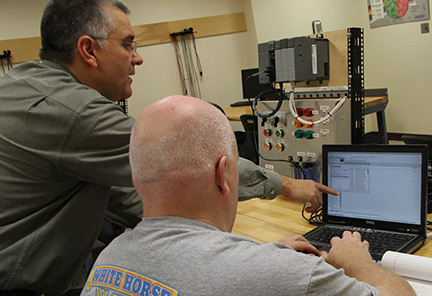 Also new is Introduction to Automation Using Programmable Logic Controllers (PLCs), taught by MCCC instructor Rich Vanderbilt using hands-on PLC workstations. The course is designed for electricians, industrial maintenance mechanics, automation technicians and energy management system operators in training who want to master the latest technologies that reduce electrical consumption and network stand-alone industrial controls, as well as automate manufacturing processes that are currently performed manually. New online courses focus on career areas including Administrative Medical Assistant, Entrepreneurship, Customer Service, Students With Autism Spectrum Disorder, Introduction to Natural Health and Healing, and Starting a Pet Sitting Business. Inside HigherEd magazine recently reported that continuing education certificates are a key component of work force development, and that the need within the labor market drives their creation. CCS also offers a variety of personal interest classes. Short-term classes start throughout the spring on subjects ranging from world languages to writing, personal finance, cooking, gardening and more. For more information, visit www.mccc.edu/ccs or call (609) 570-3311.